Hezbollah leader Hassan Nasrallah -- seen here in September 22, 2006 -- says three spies have been discovered in the group. 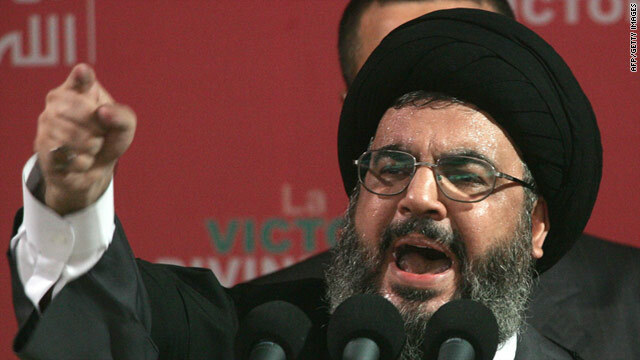 Beirut, Lebanon (CNN) -- Hezbollah leader Hassan Nasrallah said that the militant Islamic group has uncovered three spies within its ranks, two of whom were recruited by the CIA, Lebanon's state news agency reported. The U.S. embassy in Beirut dismissed the report as "empty accusations." Nasrallah declined to give the names of the suspected spies, offering their initials instead, Lebanon's National News Agency (NNA) said in its report Friday. "The first name is A.B. This person was recruited five months ago by a CIA officer," Nasrallah said. The alleged spy confessed his relation to the CIA after Hezbollah found out about him, according to Nasrallah. The second spy, "H.M.," was recruited by the CIA before "A.B." Nasrallah referred to the third accused spy as "M.A.," the NNA reported. "We confirmed that he collaborated with a foreign body and we are still investigating which one," Nasrallah said about the third suspected spy, according to the agency. The Hezbollah leader stressed that none of the individuals involved in spying was a high-ranking official and, as such, they were not in a position to harm the organization. Nasrallah accused the CIA of acting at the insistence of Israel. Hezbollah and Israel fought a war in 2006. "When Israel failed to infiltrate Hezbollah, it asked the help of the CIA," Nasrallah said, according to NNA. A U.S. embassy spokesperson in Beirut rejected Nasrallah's claims. "These are the same kinds of empty accusations that we have heard repeatedly from Hezbollah. There is no substance to his accusations," the spokesperson said. "It appears as if Nasrallah was addressing internal problems within Hezbollah with which we have nothing to do. Our position towards Hezbollah is well known and has not changed."